There are many things we’re doing right as humans learn their way ’round Earth. In this Monday’s Blue Planet Almanac, at 8:00 AM PDST, we’d like to devote some time to some positive things while still keeping our challenges in mind. Starting us off will be a fascinating interview with Karen Sussman of the International Society for the Protection of Mustangs and Burros (ISPMB). Formed in 1960, IPSMB operates from the Cheyenne River Sioux Indian Reservation in South Dakota. Although today’s horses and donkeys were imports from America’s conquistador days, many United States laws and activities have been drafted over the years to help protect them. 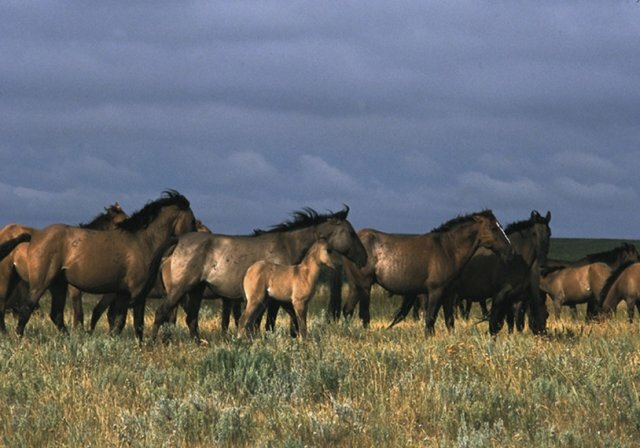 ISPMB is about trying to help feral horses and burros thrive. 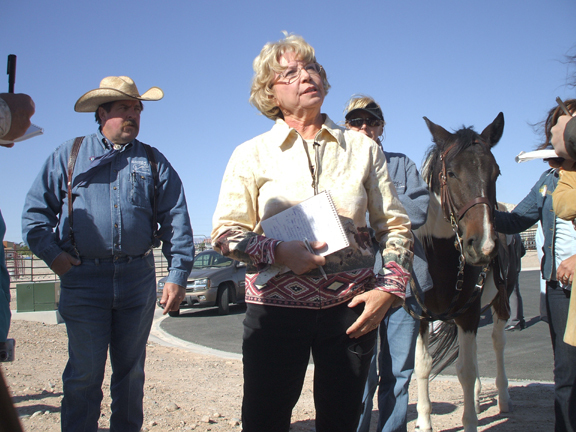 Karen has 58 years as a successful advocate for horses and burros. Since she works for a nonprofit, Karen has no time for the PR common to women in her executive role. Her bio’s longer than could be given justice here, but she’s the sort with story upon story about her wonderful activities. ISPMB’s list of achievements is long. Be sure and be with us to hear about Karen’s experiences with these beautiful, wild creatures! And, there’s more good news! 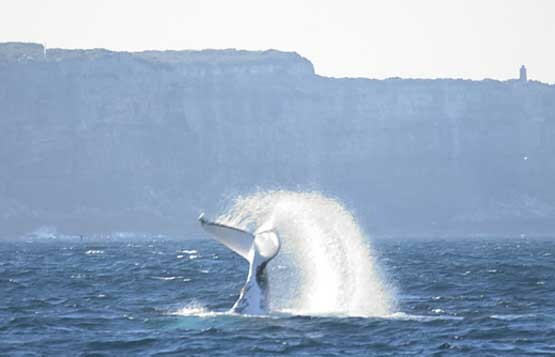 Although the International Whaling Commission has recently been suggesting that the worldwide ban on commercial whaling be lifted, they just agreed not to – just last week. Many of us were worried about this, including President Obama’s support in lifting the ban. It’s not like the decades-old whaling ban is something many of us wouldn’t expand greatly. Most environmentalists would prefer that Norway, Japan and Iceland discontinue their controversial whaling practices. But a whole bunch of us are now wiping our brows in slight relief there won’t be a massive step backwards. From the respected International Fund for Animal Welfare (IFAW), Blue Planet Almanac will talk about this new International Whaling Commission development with Patrick Ramage, IFAW’s Global Whale Program Director. 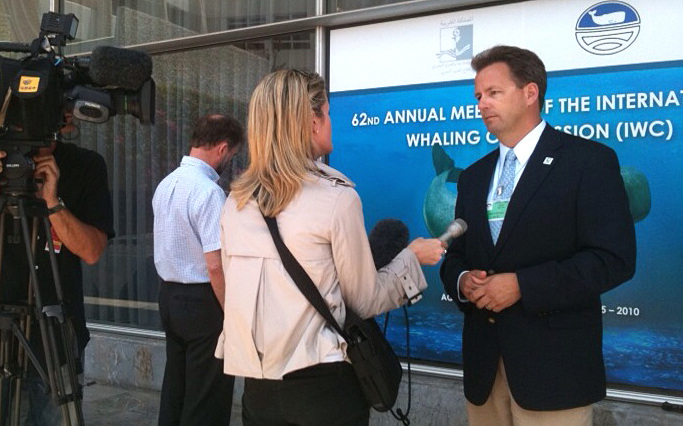 See IFAW’s specialized page about it’s anti-whaling programs. Patrick Ramage (right) at the Agadir, Morocco IWC meeting with Australian Broadcast Corporation/ABC News. This thought is directly related to what any biologist worth his salt would say, including Tom Lovejoy of the H. John Heinz, III Institute. Biodiversity depends directly upon us and is now in our hands. Anna Cummins & Dr. Marcus Ericksen, with their artful “logo.” Like a Buddhist sand mandala, no? Just with different materials. 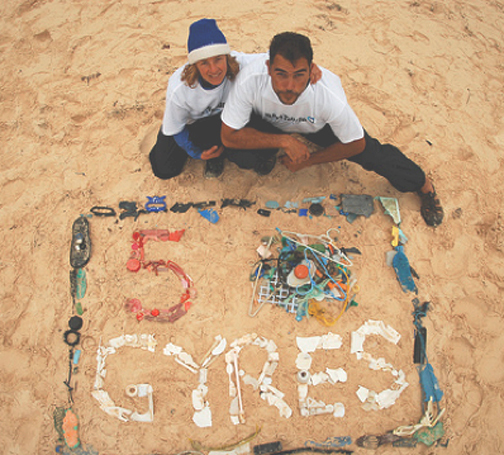 And, wrapping this Monday’s Blue Planet Almanac with us will be the adventurous and courageous Dr. Marcus Ericksen and Anna Cummins, both of the 5 Gyres project and the Algalita Marine Research Foundation. Anna and Marcus’ pictures are in every dictionary’s definition of peripatetic. When we were setting up this interview, these two marine scientists wrote that they were in Wyoming. On vacation. ??? Gathering dinosaur bones. !!! Anna told me that Marcus has done this every summer for the past 19. Anna and Marcus have been our guests before, but they have some important news to report about their research and education programs. Many of us know about the Great Pacific Garbage Patch, first brought to light by Anna and Marcus’ friend, Charles Moore of Algalita Research Foundation. The garbage patch is called by other, different names, too, including the Eastern Garbage Patch. The characteristics of the plastic debris, toxic chemical sludge and trash in this patch usually makes individual particles small and diffuse, so the Pacific Garbage Patch’s scale is massive. Anna and Marcus say to think of a soup of debris instead of floating islands or patches. Here’s a good interview with Anna by Discovery News’ Jorge Rivas, showing you what a marine garbage patch really looks like. Of course, these plastics and chemical sludge are now both in the marine food chain. The sludge and plastic eventually become small, and are ingested by the same animals we eat. The same animals other predators eat. Plastic is well-known to attract toxic organic compounds, concentrating them. Maybe the Pacific Toxic Soup would be a more memorable name? In this manner more effective bio-accumulation occurs in the organisms which eat the Toxic Soup. 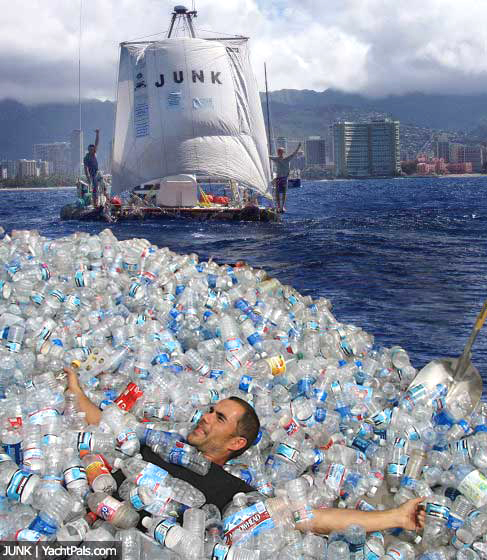 Dr. Marcus Ericksen does the backstroke in a microsea of junk. Wikipedia writes that this one gyre’s patch could, “… range from 700,000 square kilometres (270,000 sq mi) to more than 15,000,000 square kilometres (5,800,000 sq mi) (0.41% to 8.1% of the size of the Pacific Ocean), or, in some media reports, up to ‘twice the size of the continental United States.” This makes it much, much bigger than a Texas-sized garbage patch. Think of a massive cauldron at temperatures lower than a crockpot. But – get this – there are at least five such patches of Toxic Soup in our oceans. There are five major ocean gyres collecting the stew efficiently, 24 hours of each and every day. Mother Earth is very predictable and reliable. The five major gyres are the North Atlantic Gyre, the South Atlantic Gyre, the Indian Ocean Gyre, the North Pacific Gyre and the South Pacific Gyre. Bringing together the knowledge needed to assess and solve this problem are what Anna and Marcus are working on right now, in cooperation with the partners of their forward-thinking, creative 5 Gyres project. Blue Planet Almanac radio airs live with host Mike Austin on HealthyLife.net on the 4th Monday of each month at 8:00 A.M. Pacific time. Blue Planet Almanac is also re-broadcast later in the week and shows are archived three days after airtime at that same site. HealthyLife.net is an all-positive talk station and has over 3 million listeners monthly in 104 countries and all 50 United States. Blue Planet Almanac offers thoughtful perspectives on conscious, green living on Earth. With fascinating interviews, breaking news and product reviews, caller participation about Lifestyles of Health and Sustainability are encouraged, including science and policy of importance to Earthlings. Listeners can have their say in an environment that matters or simply listen to leaders in their field. Join us live!